To connect a LinkedIn Company Page to Edgar, you must first connect a personal LinkedIn profile that is an admin for that Company Page. Once your profile is connected, click the LinkedIn Company button at the bottom of the Accounts page in Edgar and select your company page. If you've successfully connected your LinkedIn Profile but are unable to connect your LinkedIn Company Page, refresh your LinkedIn Profile connection, making sure to give Edgar full permissions if prompted, and then click the LinkedIn Company button again. If you are still unable to connect your LinkedIn Company Page after a profile refresh, you may need to reset your LinkedIn connection. Go to LinkedIn and make sure you're logged into the account you're trying to connect to Edgar. Go to https://www.linkedin.com/psettings/. 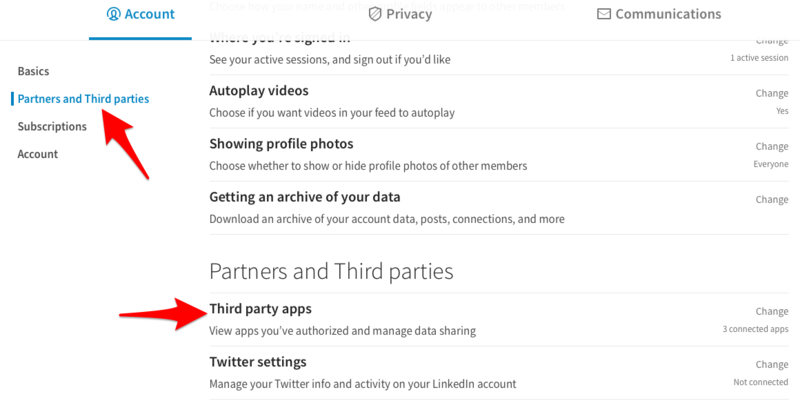 Click on Partners and Third parties, then choose Third party apps. Find MeetEdgar on the list and remove it. Go back to https://app.meetedgar.com/accounts and click on the refresh icon for your LinkedIn profile. Click the LinkedIn Company button on the Accounts page again to see a list of your pages.